Part 4 is 16.58 minutes long and can be accessed by clicking on Simple Marketing Now on Retailer Websites. Menus are important because they help website visitors figure out how to get around and find the fantastic content that you've created that answers their most intense questions about your product or service. A good menu and website navigation helps build trust, encourages visitors to spend time on your site and eventually become customers. Think where your visitors want to go, what questions they want answered. Have that preplanned and offer visitors ways to get there quickly. Be consistent! Visitors expect to see a menu when they first reach a site, either at the top or on a sidebar. They expect to find the menu consistently in that same location as they travel through your site. Remember that inconsistency in the placement of the menu from page to page creates confusion and makes a visitor uncomfortable. That in turn means they will become distracted and won't focus on what you offer. Worse yet, they will disappear as fast as they can! You don't want your site to generate negative feelings. A website menu helps you organize your website for your visitors. Be descriptive; be relevant to your visitors. Help them make decisions. Keep your menu choices to no more than 8. As Sheena Iyengar, who contributed to the Paradox of Choice, noted the ideal number of choices that our perception and memory can handle is the magical #7 +/- 2. Don't assume that people only come to a website to buy. They also come to explore and learn more. 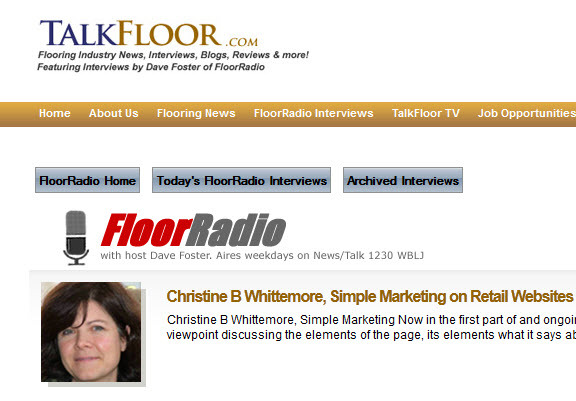 Many come to a flooring website at the very early stage of the buying process [i.e., at the top of the purchase funnel]. Be ready for them so you can build a relationship. Think through your visitor's user experience on your website. Pay attention to common layouts that web visitors are familiar and comfortable with. Look at how sites such as Amazon or Zappos handle navigation. You can learn a lot and possibly adopt some of those ideas. Aim for clean and intuitive navigation, where visitors don't have to think too hard. Has 7 menu choices. The navigation is clean, clear. The convention for the placement of 'home' is on extreme left. Here it's on the right. Took me a while to find it. Confusing. Has 7 tabs on menu + subtabs to organize related content. You'll notice a blog. 8 menu options with subtopics - including interesting ones such as financing, testimonials, business options all grouped together. I like the featured products call to action. Has a long list of menu options - possibly 40 or 50? Links are organized under categories - 20 under carpet. This could be simplified. I found it hard to scan quickly and make sense of the choices. I like that the links include lots of good information. Can the information be made more actionable and relevant to visitors? Offers a menu with 8 options. I love the tab called photos! Note the subtabs for products. It's very effective to create specific pages dedicated to specific products with links to them from the home page. The tabs across the top are product focused with lots more options. Note the right sidebar with additional menu itmes that change depending on section. This could become. It might be effective to have a design tab on the permanent menu depending on what the web traffic stats say about which pages get the most traffic. Has a similar setup to Big Bog with more menu options ~11 including insurance services and green flooring. Left sidebar. As with the retail experience, think like your customers. Figure out what makes them comfortable so they can relax, trust you , spend time on your site and eventually buy. Make it easy for customers and visitors. Do you agree? What is your assessment of the navigation of these websites? As you examine website menus and navigation with a fresh set of eyes, think about how you direct visitors and how you direct them through your website. How do your menu and navigation help you accomplish that? What websites have you come across that you find effective? Let me know in the comments.